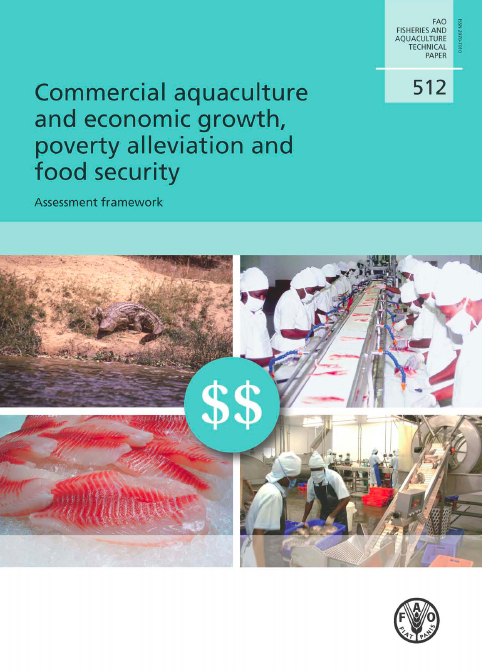 Commercial aquaculture and economic growth, poverty alleviation and food security. Assessment framework. The designations employed and the presentation of material in this information product do not imply the expression of any opinion whatsoever on the part of the Food and Agriculture Organization of the United Nations (FAO) and United Nations Environment Programme (UNEP) concerning the legal or development status of any country, territory, city or area or of its authorities, or concerning the delimitation of its frontiers or boundaries. The mention of specific companies or products of manufacturers, whether or not these have been patented, does not imply that these have been endorsed or recommended by FAO and UNEP in preference to others of a similar nature that are not mentioned. FAO Fisheries and AquacultureTechnical Paper; No. 512. Rome, FAO. 2009. 69p. This paper proposes some methods for quantifying the contribution of aquaculture to national economies, poverty alleviation and food security so as to improve the much needed political and financial support to the sector for its adequate development. Aquaculture’s contribution to a country’s economy can be measured by “aquaculture value-added multiplier”, an indicator that represents the “increase in gross domestic product corresponding to a one-unit increase in aquaculture value-added. As alleviating poverty occurs by creating well paying jobs, evaluation of the contribution of aquaculture to poverty alleviation can be done through “aquaculture employment multiplier”, the increase in the total employment for the entire economy corresponding to one extra job created in aquaculture. The contribution to food availability, one of the three dimensions of food security, can be assessed through the “net sum of protein-equivalent” (direct contribution) and the “ratio between the aquaculture net foreign exchange earning and the total value of food imports” (indirect contribution). “Aquaculture labour-income and employment multipliers” can be used to quantify aquaculture’s contribution to food access, the second dimension of food security. Aquaculture tax multiplier and the “aquaculture ratio between the net foreign exchange earning” and the “whole economy net foreign exchange earning” can be used to estimate the sector’s contribution to food utilization, the third dimension of food security.